Is it just me or is there a lot more interest in roast meat and pies this time of year…maybe it’s the weather! There is something about crisp Autumnal days that gets the craving for roast beef or lamb really, really rolling especially if you have spent the better part of the morning getting soaked and muddied by two giant dogs on a beach….a salad aint gonna cut it, you gonna need something a tad more substantial! My local butcher’s shop Fenelons in Stillorgan have been providing me with the best meat I have ever had the pleasure to cook with and this is directly from their shop, big thanks to Declan and the boys (and girls) – sterling work and sterling product! Kick things off by combining the mustard oil and garlic – you want a loose enough paste/marinde. Smoother the leg fillet with the mix pop in a bowl and fridge for about 24 hours. When you are ready to cook – add the cooled spuds to a baking tray (the shallower the better), glug over a good couple of table spoons of olive oil and place in a pre-heated oven at 200c to get roasting. 20minutes into the roasting of the spuds season the lamb well add to a roasting tray then into the oven with the spuds. The lamb should only take about 30minutes to cook medium rare. After 30minutes remove the lamb, cover with foil and a couple of teal towels and let rest for about 15minutes. When the lamb is resting you can start making the rosemary salt – add the salt to a mortar and pestle, break in some sprigs of the rosemary and roughly grind. 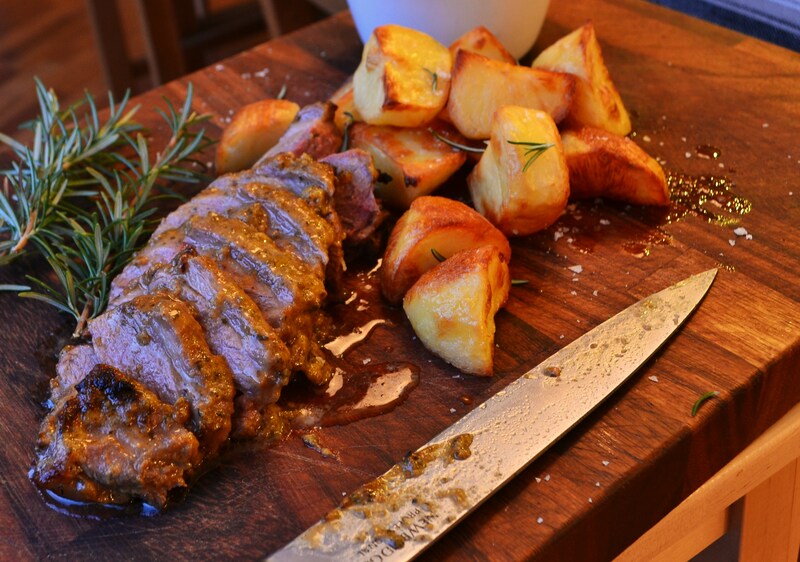 To serve carve the rested lamb thickly and scattered the rosemary salt over the roasties – and serve rough and ready on a board with some Autumn greens – spinach and courgettes!